It just drips coolness like no other. It’s damn near impossible to find anything wrong with the original Acura/Honda NSX. It was something that literally came out of nowhere. Well, it came from Honda, but the carmaker was known at the time more for its reliable Accords and Civics. 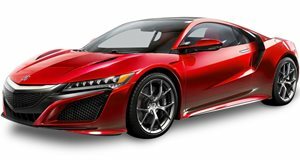 But then the NSX premiered in 1990, and everything changed. Seriously, Ferrari and Lamborghini saw it as a real threat for many reasons. Those of us who grew up during this time still think of the first-gen NSX as something special. That’s because it is, and the guys at Regular Car Reviews won’t argue with us here. Along with this new video, we’ve also come up with nine reasons why the original NSX was the greatest car of the 90s. Yes, even better than the Mazda MX-5 or Toyota Supra. 1. Awesome interior layout. 2. Timeless exterior designed by Pininfarina. 3. Ayrton Senna helped develop its chassis. 4. Buying one is a great investment. 5. It’s extremely comfortable and feels like a race car. 6. Uh, it’s Honda-reliable. 7. VTEC engine! Yep, that's a naturally aspirated V6 mated to a five-speed manual. 8. Honda didn’t need to make it but did. 9. Pop-up headlights.